The Commission discussed the respect of the Rule of Law in Poland and launched a dialogue under the Rule of Law Framework. It also discussed migration, the Investment Plan for Europe, a pillar of social rights and the treatment of China in anti-dumping investigations. During its first formal meeting in 2016, the College of Commissioners discussed several important issues: The College held an orientation debate on recent developments in Poland and launched a structured dialogue under the Rule of Law Framework. It had an exchange on the state of play on migration and the achievements of the Investment Plan for Europe so far. It also held an orientation debate on a European pillar of social rights and on treatment of China in anti-dumping investigations. The Rule of Law is one of the fundamental values upon which the European Union is founded. The Commission, beyond its task to ensure the respect of EU law, is also responsible, together with the European Parliament, the Member States and the Council, for guaranteeing the fundamental values of the Union. Recent events in Poland have given rise to concerns regarding the respect of the rule of law. The Commission had therefore requested information on the situation concerning the Constitutional Tribunal and on the changes in the law on the Public Service Broadcasters. The College of Commissioners held a first orientation debate on these developments in order to assess the situation in Polandunder the Rule of Law Framework. 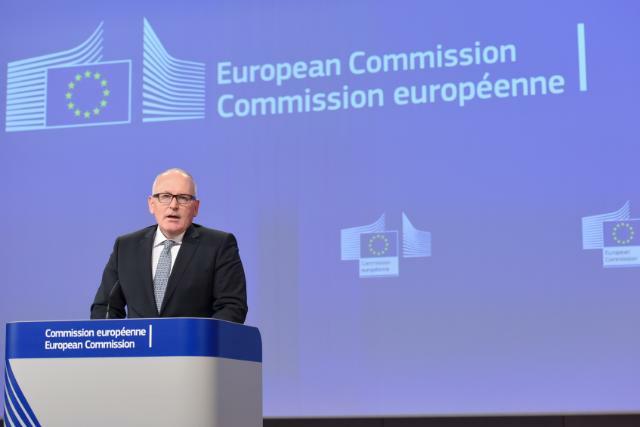 Following today's orientation debate, the College mandated First Vice-President Timmermans to send a letter to the Polish government in order to start the structured dialogue under the Rule of Law Framework without prejudging any further step. The College agreed to come back to the matter by mid-March, in close cooperation with the Venice Commission of the Council of Europe. Echoing what President Juncker said last week, First Vice-President Timmermans underlined after the College meeting that this is not about accusations and polemics, but about finding solutions in a spirit of dialogue. He underlined his readiness to go to Warsaw in this context. In 2015 the European Commission swiftly took measures to respond to the refugee crisis, and continues to work with Member States and third country partners to manage the flow of people, protect Europe's borders, and address the root causes of these migratory pressures. The College left no doubt that in 2016 the EU must step up its efforts in the fields of relocation, resettlement, hotspots, returns, and the establishment of a European Border and Coast Guard. The Commission will continue to shape up our future policies and will submit a proposal on the revision of the Dublin System by March, prepare a package of measures on legal migration and present a package on migrant smuggling by the end of 2016. On Turkey, the Commission's recommendation for a voluntary humanitarian admission scheme with Turkey should be complemented with actions on the ground as well as a more structured framework for resettlement. The Investment Plan for Europe adopted in November 2014 as the first major initiative of the Juncker Commission is now operational and has the potential to bring investment back in line with its historic trends. Via the European Fund for Strategic Investments (EFSI), the European Investment Bank is able to respond quickly to financing needs in areas where alternative sources of financing are scarce or unavailable due to a higher-risk environment. It invests in the most strategic parts of the European economy. It creates jobs. We are now seeing the first results. By the end of 2015, the European Fund for Strategic Investments had already mobilised over 45 billion euro of new investment across Europe – in infrastructure and innovation projects as well as providing funding opportunities for start-ups and small enterprises. Mobilisation of private capital is a key feature of the EFSI and currently represents about 80% of the total investment value. And this is just the beginning. More projects are in the pipeline, and a new Investment Committee is up and running, approving projects even more quickly. President Juncker underlined in his 2015 State of the Union address the importance of a deeper and fairer internal market and the concept of a European pillar of social rights. The College will come back to this initiative soon. An orientation debate will be held and a concrete outline will be presented in the coming weeks, followed by a broad consultation in early 2016. Further to the expiry, in December 2016, of certain provisions in China's Protocol of Accession to the WTO, the Commission had a first orientation debate on whether, and if so how, the EU should change the treatment of China in anti-dumping investigations after December 2016. The discussion covered all implications surrounding this issue, in particular the potential impact on jobs in Europe. No decision was taken yet, the Commission will continue developing the options for the way forward in this matter.